Part of the shoe that covers the front of the foot. Visible stitching that both embellishes and reinforces the shoe. Thin strip used to join the bottom of the shoe to the part that goes around the foot. Part of the shoe that covers the toes, with perforations forming a more or less conventional decorative pattern. 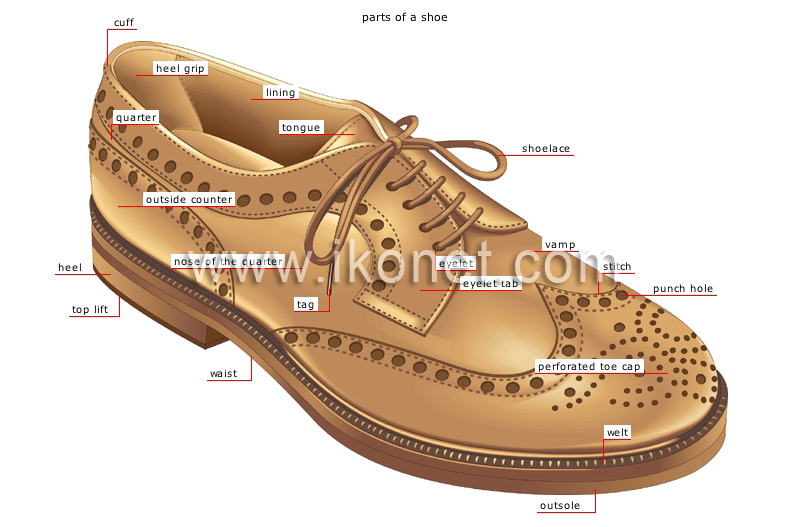 Each of the small holes made in the shoe to form a decorative pattern. Part where the quarter extends forward on each side of the shoe. Curved part of the shoe supporting the arch. Thin, usually leather or rubber piece affixed under the heel to prevent wear. Part of the quarter that is sewn on or simulated and surrounds the heel of the foot. Back part of the shoe that surrounds the heel of the foot and extends over the instep to reinforce it. Part of the lining that makes it easier to put the shoe on or holds the heel of the foot inside the shoe, depending on the type of shoe. Strip of fabric or leather inside the shoe, running along the edge of the lining. Narrow cord of fabric or leather, flat or round, that is threaded through eyelets or hooks to tighten the shoe. Extension of the vamp that prevents the fastening system from rubbing against the foot; it is lifted when the shoe is put on. Fabric or leather facing that protects and finishes the inside of the shoe. Sturdy piece of rubber or leather that forms the bottom of the shoe and is in contact with the ground. Stiff part underneath the shoe that supports the back of the foot. Piece sewn on to the nose of the quarter to reinforce the shoe; the laces pass through it. Metal or plastic sheath that covers each end of a lace to ease it through the eyelets.